On Sunday, December 9, 2012, the Rev. Brandt Montgomery celebrated all three masses at Canterbury Chapel Episcopal Church and Student Center in Tuscaloosa, Alabama, a parish that ministers to both residents of Tuscaloosa and students at the University of Alabama. The day was joyful because this was Fr. Montgomery’s first Sunday celebration as a priest, since his ordination on December 2, 2012. The day was also historic: He is the first African-American priest ordained in the Diocese of Alabama in almost three decades and the first ever in the 182-year history of the diocese to serve in a majority white parish. He is only the third African-American priest to be ordained by a Bishop of Alabama. Fr. Montgomery graduated with honors from General Seminary in 2012 and earned the 2012 George Cabot Ward Prize for reading of the Bible and the Service of the Church. He began his ministry as Curate and Assistant Chaplain at Canterbury Episcopal Chapel on the University of Alabama campus on July 1, 2012, ministering alongside another GTS graduate, the Rev. Marc Burnette (M.Div., ’99), Chaplain and Rector. GTS Dean Patrick Malloy attended Fr. Montgomery’s ordination and earlier that morning, with Fr. Montgomery still serving as a deacon, preached at the services of Canterbury Chapel. “That he came all the way from New York City to Tuscaloosa was just wonderful,” Fr. Montgomery said. “People greeted him very warmly.” At the ordination service, Dean Malloy served as one of Fr. Montgomery’s clergy presenters and signed his name as the clergy witness to Fr. Montgomery’s Solemn Declaration of Conformity. While at GTS, Fr. Montgomery preached a powerful senior sermon, for the feast of the Rev. Absalom Jones, about the experience of African-Americans and other minority people in The Episcopal Church who “sought solace and freedom embedded within the Anglican ethos, but were excluded for so long from its total riches.” Fr. Montgomery spoke of the injustices of the past, and indeed the present, but also proclaimed hope for the breaking down of barriers. “Why, in 2012, is The Episcopal Church still a majority white church?,'” he asked. “Whether we want to believe it or not, the pain from the days of slavery, racial prejudice, and oppression still haunts us. That is why the legacy of Absalom Jones is still relevant today. Absalom Jones reminds us that the church of God is not a church reserved for just rich white folks, but a church whose Savior knows no boundaries and is completely color blind. As he did in his own time, Absalom Jones is challenging the 21st century Episcopal Church to be a true reflection of the vision of God.” To hear his sermon, click here. To read more about Fr. 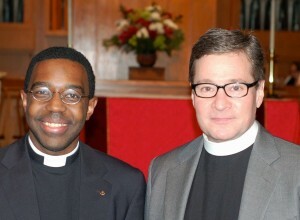 Montgomery’s ordination, click here for an article in The Shelby County Reporter.